Celine said yes to the dress on May 5th 2016 and Once Upon A Time Weddings was her first stop for dress shopping! She trusted her gut and knew she had found the one! 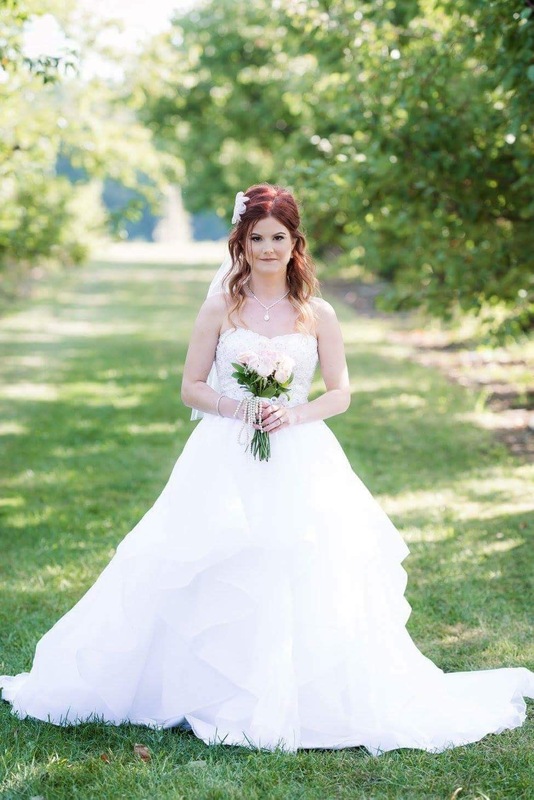 Celine also came back for her maids gowns and says this about her second experience, "My second experience was really helpful, accommodating and I felt like I trusted the staff to find what style I was looking for." We love seeing you brides more than just once! Enjoy reading all about Celine's experience saying yes to the dress below! "Technically one, because the first dress I tried on was the one I came specifically for and ended up saying "Yes" too, but about 3-4 others afterwards." "Yes, just like I envisioned!" "It was still early in our engagement so I wasn't even planning on shopping yet, but OUATW uploaded a picture on their facebook page of a brand new gown that I happened to see. I was gushing with joy, and I just knew it was "The one" and so I called the next day to make an appointment for that following Saturday. I wasn't expecting to purchase that day, but my mind was so set on the dress I seen that I just needed to know for sure. They say that most brides don't end up with a dress they always vision themselves in, but I've always been the type of women to just know. Poofy, princess, bling and ball gown is what I always seen myself in, and I got it!" "My mom, Grandma, MOH and aunt." "My Grandma. 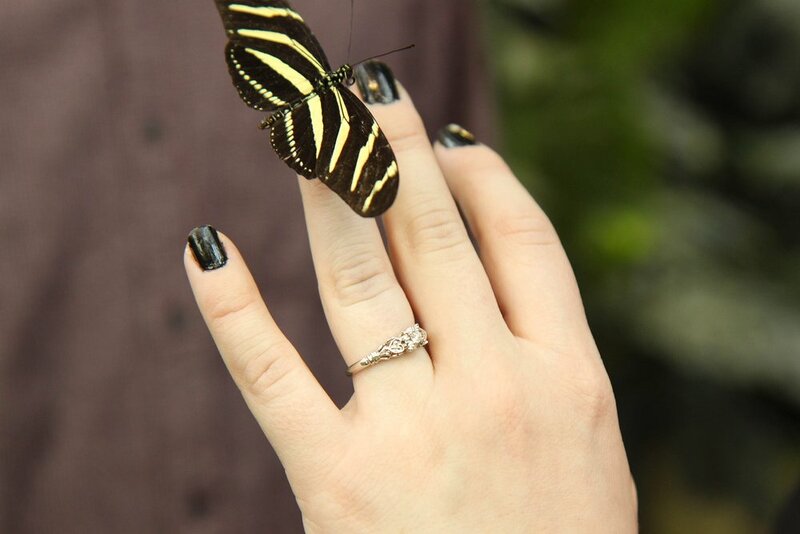 As she was helping me in it for the second time, she silently told me how I wouldn't find anything better as mine was so unique, and gorgeous." "Amazing! I'm the type who likes personal experiences, and needs to connect with others. I enjoyed the laid back, not rushed atmosphere where I felt like the center of attention. (I waited 10 years for this day, I wanted my moment) haha!" Is there anything else you want to tell us about your story to finding the dress? 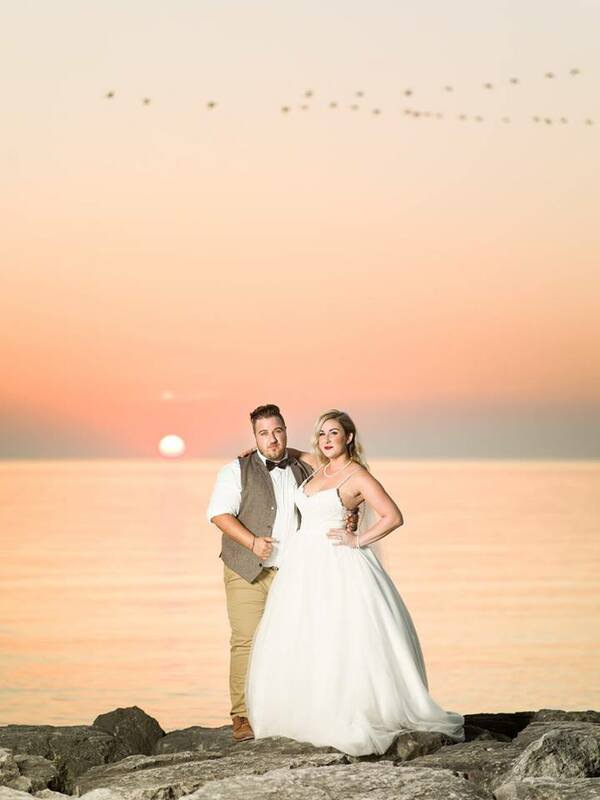 "I knew about OUTW before being engaged from other brides going there, and their great experiences so I was always excited at the thought of getting to go there myself one day. Leading up to dress shopping, I of course had pictures saved on what styles I wanted but nothing stood out to me like seeing the one OUATW posted that one magical night." Join us next week to see the maids gowns and hear all about Nate and Celine's wedding day! To book your experience with us, click here. We are starting a new and fun feature on our blog today and we couldn't be more excited!!! Wedding planning can be stressful so we thought it would be helpful to share advice from brides who have been there! Get some real life advice from everyday people who have planned their wedding. Today, we chatted with Racheal Taylor who got married on September 13th of 2014 and we are loving her real and raw advice! We hope you enjoy this new feature and get some helpful hints for your own wedding planning! "My biggest piece of advice is PLAN AHEAD. I found this really helped keep me from being overwhelmed like I hear a lot of brides being while planning their wedding. I was able to enjoy planning my wedding, crafting up decor, all while expecting our first child to be due 3 months before our wedding." "Be open minded! I had an idea of what I liked in pictures, but tried EVERY style on even if I didn't think I would like the material, fit, colour etc. In the end I actually took an element from a each dress I tried on and was able to explain those things I really liked in each dress to the OUTW tribe and they had MY exact dress, all the details I had described." "I don't know if this counts as advice but I was being super cheap with my dress I had in my head $800 max. Not because we couldn't afford more but because I'm just normally a budget freak lol. My mother in law pushed me to up my budget a bit and voila my dress was found. My dream dress." "Too big! We rented a HUGE hall with over 200 people and we both wish we scaled it down a bit for a more cozy wedding." "I am so glad I included my mother in law as much as I did. She was a major help! We couldn't have planned / decorated our wedding without her!" "Enjoy this time. This is honestly one of the most exciting moments the days and months leading up to your wedding. It goes by in a blink. Plan ahead so you are not so stressed out with everything piling up at once. I'm just itching to plan our 10 year anniversary one day! I love party planning!" How cute is that! Thank you for sharing your wisdom with us Racheal! If you are still searching for your dream gown book your experience with us right here today! Hello new year and a new monthly Once Upon A Time Weddings Real Bride! Today we are welcoming Laura and her hubby Koree Keates to the blog! We are loving their unique love story and super fun wedding details that we can't wait to share throughout the month! For now, we hope you enjoy reading a little bit about their love story! "I threw a house party and booked a band to play, he was the drummer." How'd you know your fiancé was the one? "I just knew from the start I didnt want to be without him." How did your fiancé propose? "We went for coffee in the park and when we were walking around the ponds he got down on one knee while my back was turned." Join us next week as we chat about how Laura said yes to the dress here at OUTW! If you're still searching for your dream wedding gown book your experience with us online today because we can't wait to meet you! Wow!! We can hardly believe 2017 is coming to an end! What a great and busy year it's been! From moving locations to seeing so many gorgeous brides on their wedding days! We wanted to do a little picture recap of some of our 2017 brides, we hope you enjoy seeing them as much as much as we do! If you're recently engaged, first off congrats! And secondly, we'd love to have to in the store when you're searching for your dream dress! Book your experience with us today! We wish you a Happy New Year and can't wait to meet many new brides in 2018! Ambrose and Brianne got married on October 15th, 2016 in Glencoe. These two have some really cute details that they put into their wedding day and we are excited to share them with you today! 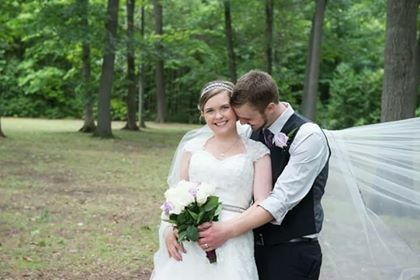 Thanks for being a Once Upon A Time Wedding Real Bride Brianne, we have loved featuring you this month! Where did you get married/have your reception? "Glencoe - St. Charles Church & Alvinston Community Centre." "Our speech (which was one of my least favourite parts to prepare for!)." Who were your favourite vendors from your wedding day? "Planner: Unmistakly You - Flowers: Mount Brydges Floral - Once Upon a Time Weddings - dress and accessories - DJ - VanRock Sound - Hair & Makeup: Darling Makeup and Hair - Cake - Zandy Cakes." Any other unique details or stories about your wedding/love story you want to tell us? "We went crazy and had a upside down wedding cake which looked really cool! We also took dance lessons and did a surprise dance mashup first dance because we had never danced infront of other people before (my moms family is always trying to get us dancing and it never works) We did two junior bridesmaid instead of a ring bearer and flower girl and they carried the flowers in these beautiful silver roses that were built into their flower bouquets. We made a family tree to hang on the wall of the reception (I have 40 first cousins so its always fun to see how big our family is) We did a memory table with personalized candles for our loved ones we had lost. We did our wedding photos at Texas Longhorn Ranch." We hope you enjoyed reading about The Waeijen's wedding day as much as we did! If you are a OUTW Bride, email us today at info@onceuponatimeweddings.ca to get more information on becoming a monthly bride feature. Do you have guests coming in for your wedding from out of town? Whether they're travelling 2 hours or 15 hours, it's nice to make them feel welcomed and help make their trip as smooth as possible! So we've put together a little list of things you can do to let them know you're grateful that they've traveled for your big day! 1. Blocking off hotel rooms. This might sound like a given but blocking off hotel rooms and giving your out of town guests this luxury saves them time and stress in researching hotels in your area. Want to go the extra mile? Send them a list of car rental places too if they are flying into town! 2. Welcome bag. This can be left in their hotel room, just a little goody bag with things to make them feel special! From water to personalized wedding gear to local goodies, you can get so creative here and who doesn't love a goodie bag?! 3. Itinerary suggestions. This is such a nice way to introduce your guests to your town, show them your favourite spots, and/or just give them something to do with their down time before or after your wedding day festivities! Think nail salons, favourite restaurants, coffee shops, shopping centres, etc. 4. Quality Time. Remember, these guests came to see the two of YOU! If you can, make time to have brunch the day after the wedding or a cocktail hour the day before your wedding. Not only will this make them feel appreciated it will also give you time outside of your wedding day to catch up with them. If this is too stressful on you, you can always give them an extra squeeze at the wedding or include out-of-towner's in your toast! Let us know what you'd like to see on our blog by commenting on this post or messaging us on our Facebook page! Book your wedding gown experience with us today right here! We are excited to share this new and exciting company based right here in Strathroy, We're Weddings! 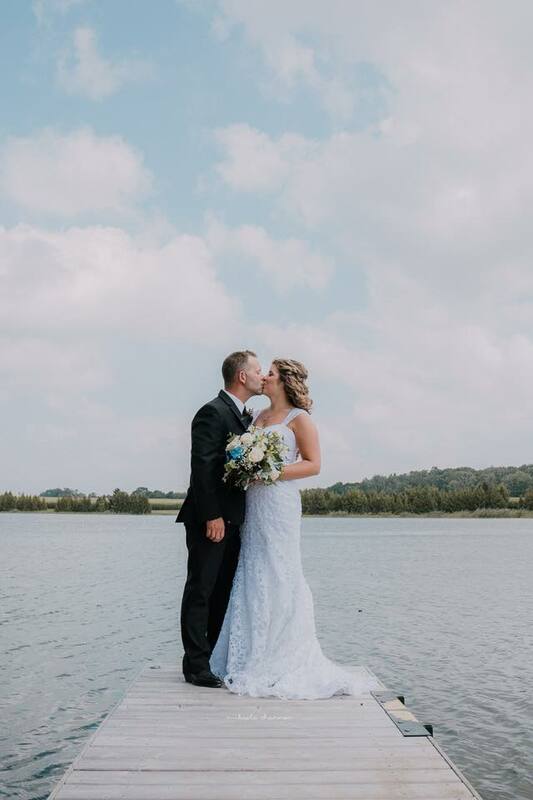 Throughout this chat with owners Mitchell Bennett and Derek Lamoureux you'll hear all about what service they offer to brides and grooms AND vendors! Their company is so unique, you don't wanna miss out on this! What kind of service do you offer to brides and grooms? "We help couples find wedding vendors that match their needs, match their budget, and are available on their wedding day." What do you offer for the wedding vendors? "For the vendors we bring them quality leads from brides in there area that are in the market for their services." 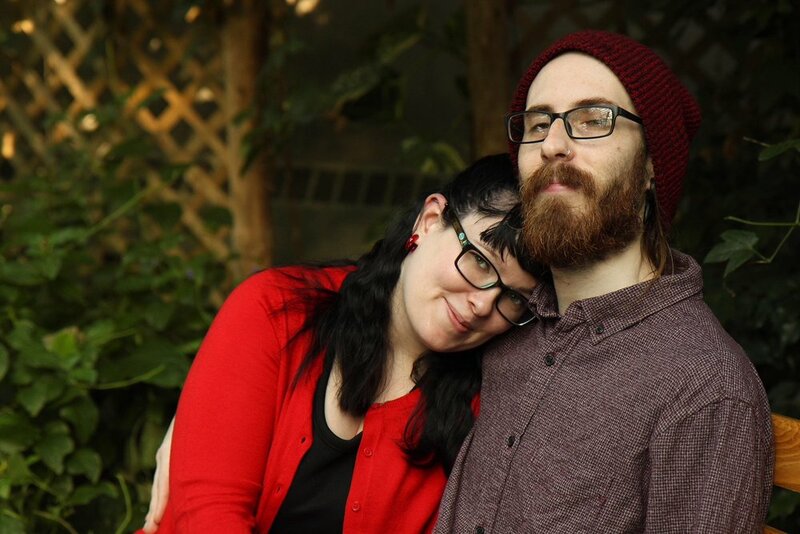 "Derek and I (Mitchell) were discussing an idea I had regarding finding musicians gigs, from that Derek suggested that this system might be a better fit for the wedding industry and I agreed." How far in advance does the Bride + Groom need to book your services? "We aim to get our brides their quotes in 3 days or less, that being said, the more time couples leave themselves the better." How does your service work? Do the bride and groom get to pick from different bids? "We collect all of the necessary information for a vendor to establish an educated quote based on the information we collect. We provide the couples with quotes that match their budget and date. From there they can take into consider the vendors individual style and past work and pick the vendor that is right for their special day." Are the bride and groom stuck with the best offer if they don't prefer that vendor? 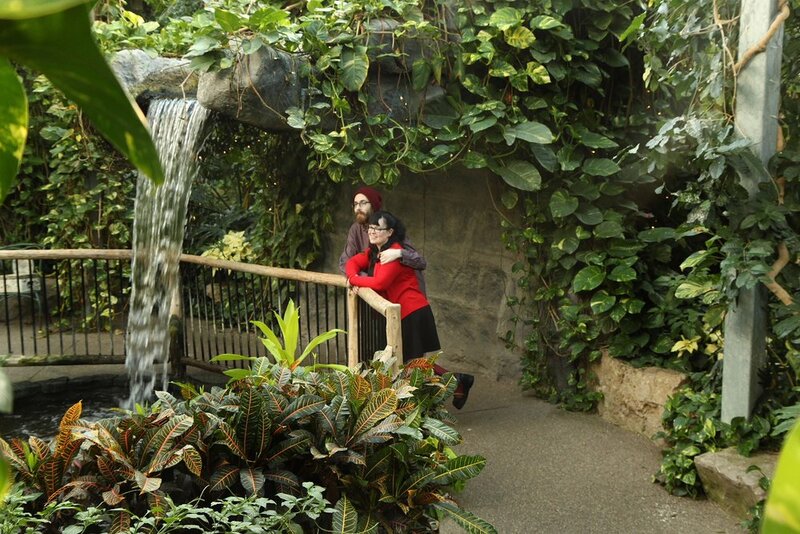 "The couple can pick whichever vendor they believe to be the perfect match." "Depending on the type of vendor some need more information then others. For instance a make up artist just needs a head count, were as as limo company needs the locations you'll be stoping at, how many people need to be transported, how long the limo has to be available for. Those are just a few examples, all categories are different." How can a Bride + Groom customize their wedding package with you? "The customization is in the hands of the vendors they select, we just help them find the right ones to match their customization." How much am I investing as a Bride + Groom? "Free for the couple (we collect money from the vendor)." Thanks for hanging out with us today! You can reach Mitchell on their website or by email: info@wereweddings.com. Leave us a comment about which wedding vendor you'd like to see on our blog next! And, as always, if you're still in search of your dream dress make your appointment with us today!